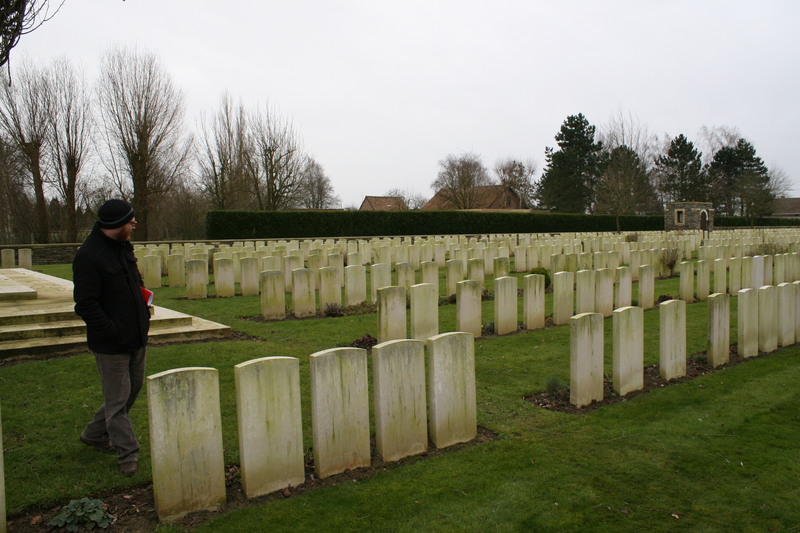 On 11th November 1918 Charles Bean, Australia’s official war historian, surveyed the battlefield of Fromelles, “We found the old No Man’s Land simply full of our dead.” On this tour we shall visit the cemeteries where the majority of the Australians who fell at Fromelles in July 1916 are now buried. So here we are, back in the Nursery. 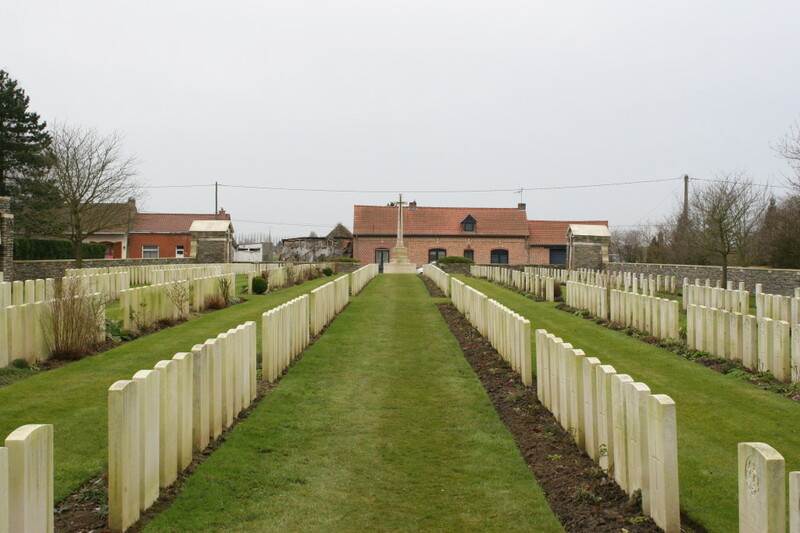 Our last visit to this part of the line saw us visiting the cemeteries in the sector immediately south of the River Lys, from Y Farm Military Cemetery, to the south east of Armentières, north to the cemeteries at Houplines. This tour starts about half a mile to the west of Y Farm*, and will wend its way south west, and then south east, until we arrive at the Aubers Ridge and the village of Fromelles. This is still the Nursery, folks, but it would no longer be by the morning of 20th July 1916. 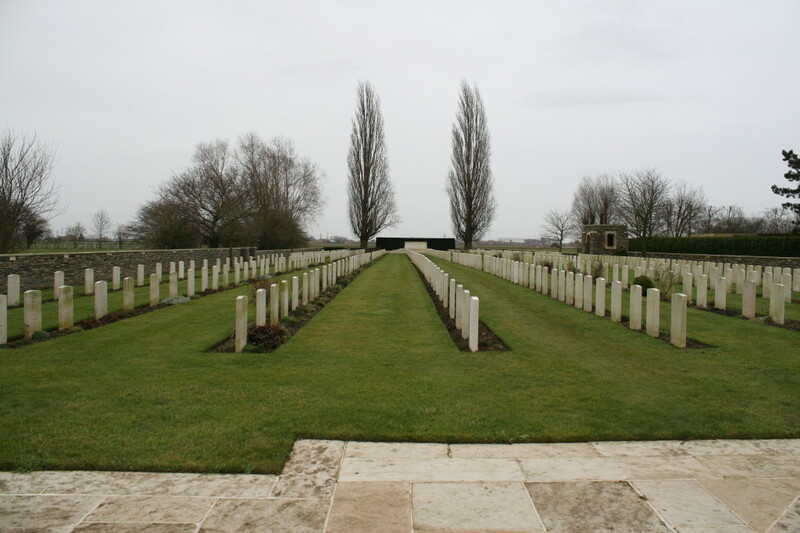 *Y Farm Cemetery contains the bodies of thirteen identified Australians, twelve infantrymen and an artillery Captain, who were killed on 19th July 1916 at Fromelles. The first Australians had begun to arrive on the continent of Europe in late March 1916, a month or so later taking over the trenches to the south and west of Armentières, between the River Lys in the north and the small German salient known as the Sugarloaf near the village of Fromelles ten miles to the south. 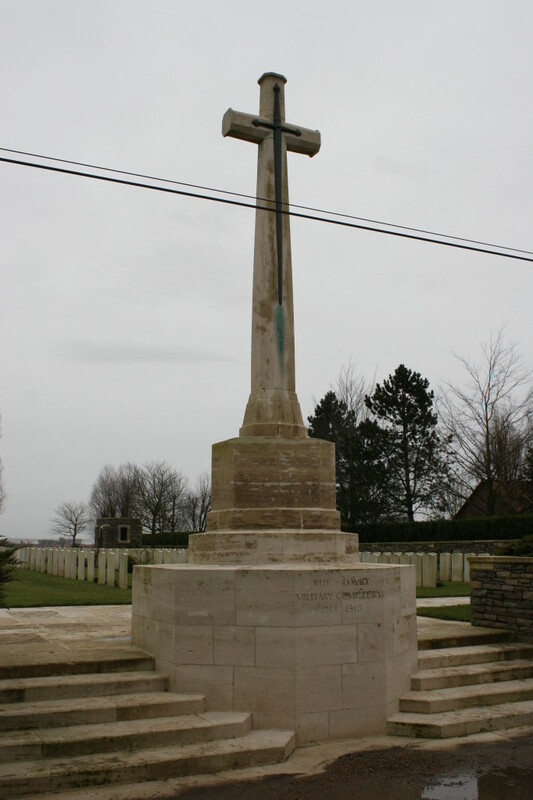 The sector was known to the British as the Bois-Grenier sector, to the Australians as the Fleurbaix sector, and had seen no serious fighting for nearly a year, the British using it to introduce new divisions to trench warfare. It was during the Australian tenure of this sector that it began to be referred to as the ‘Nursery’. 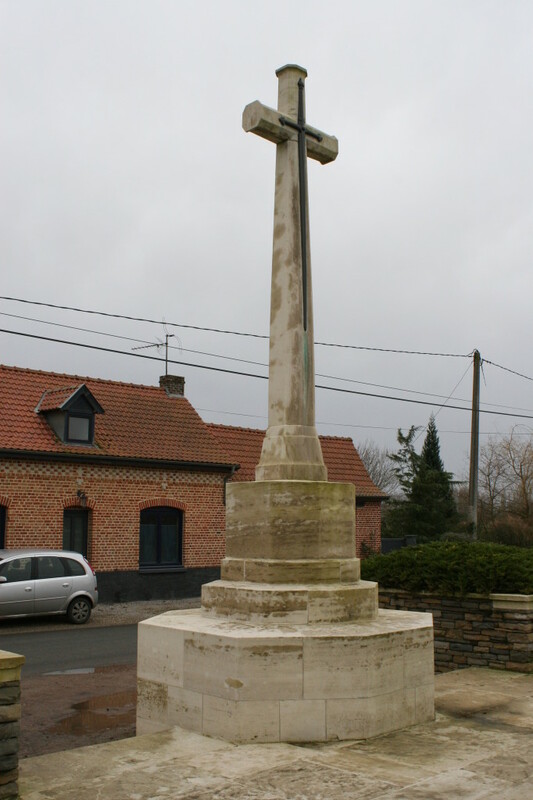 The village of Fleurbaix is about three miles south west of Armentières, and for much of the war found itself only a mile or so behind the British lines. Unsurprisingly, as the war progressed, a considerable number of cemeteries grew up around the village and today three of them, all begun during the fighting during the latter days of 1914, and all considerably increased in size after the war as graves from the smaller cemeteries were reburied in them, still remain between the village and the old front line. 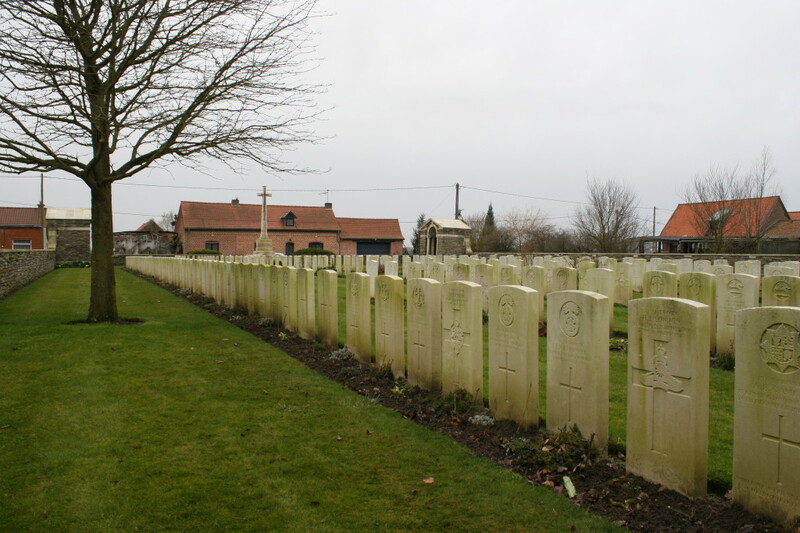 Rue-David Military Cemetery consists of eight long lines of headstones split into just four plots. Although the cemetery was begun at the start of December 1914 (possibly a couple of weeks earlier), only 220 graves were here when it was closed at the end of 1917, all in what is now Plot I (above). 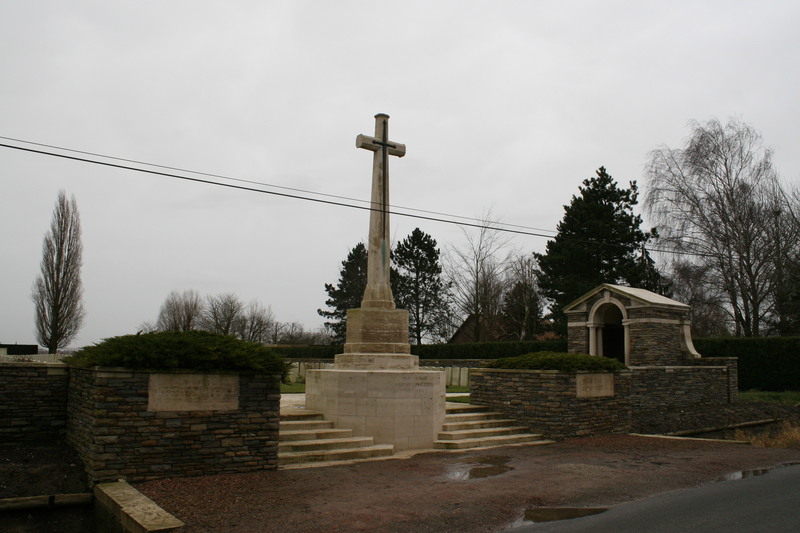 After the war, as with so many cemeteries we visit, Rue-David Military Cemetery was greatly increased in size as men were brought in from the smaller cemeteries I mentioned earlier and the battlefields of Aubers and Fromelles. 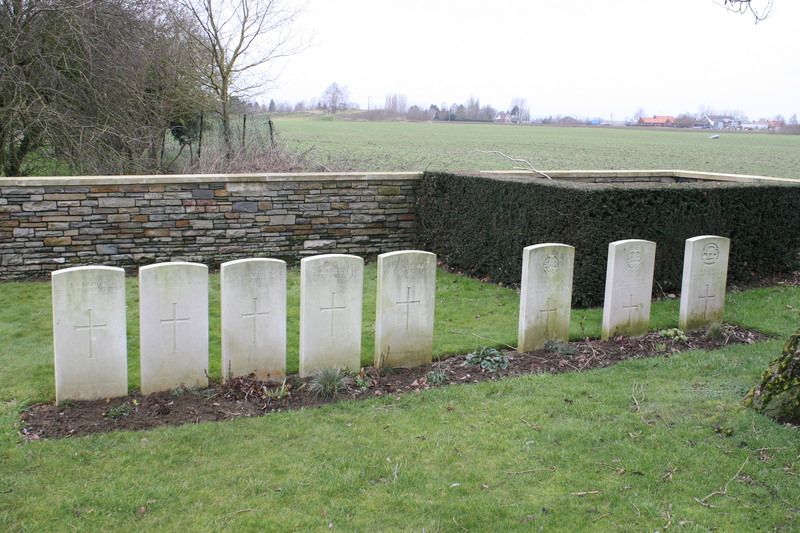 A small number of Germans are also buried here; of the six graves pictured above, four of these men are unidentified, with two identified men at the far end of the row, both killed on 16th April 1917. 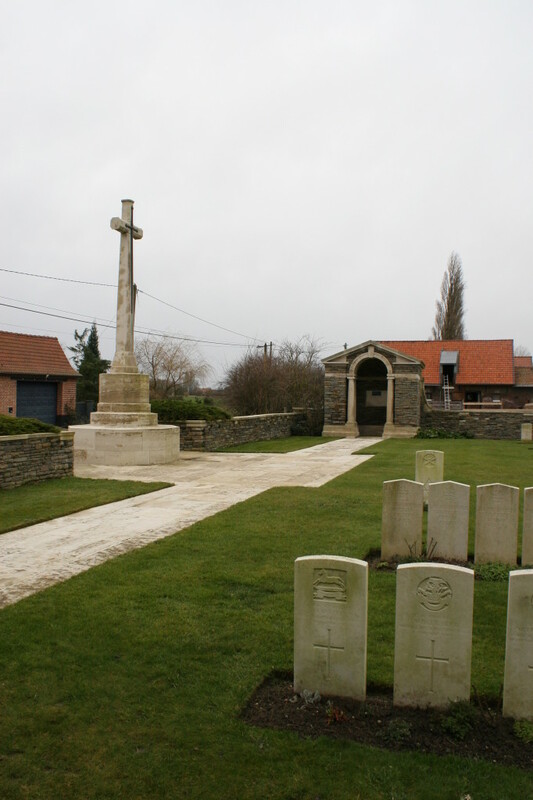 If you wish to take a look at the cemetery plan, courtesy of the CWGC, then click here. View from the southern corner of the cemetery, the same German graves visible in the second row. 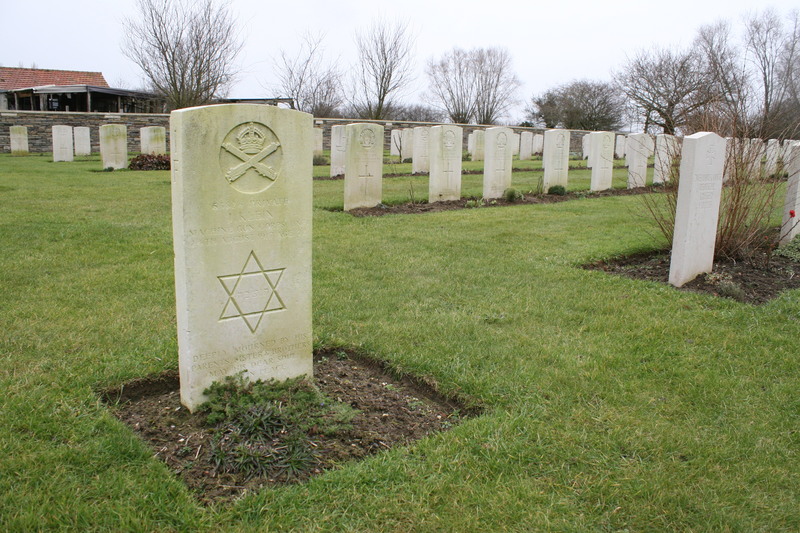 The single headstone in the middle distance of the previous photograph, that of machine gunner Private Isidore Klein. 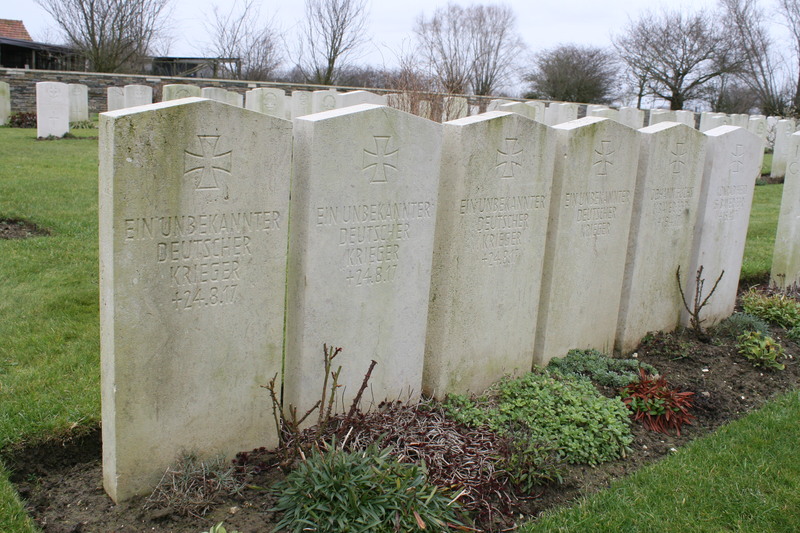 Note another German headstone on the right, where two German soldiers, both killed on 10th December 1916, are buried in one grave. 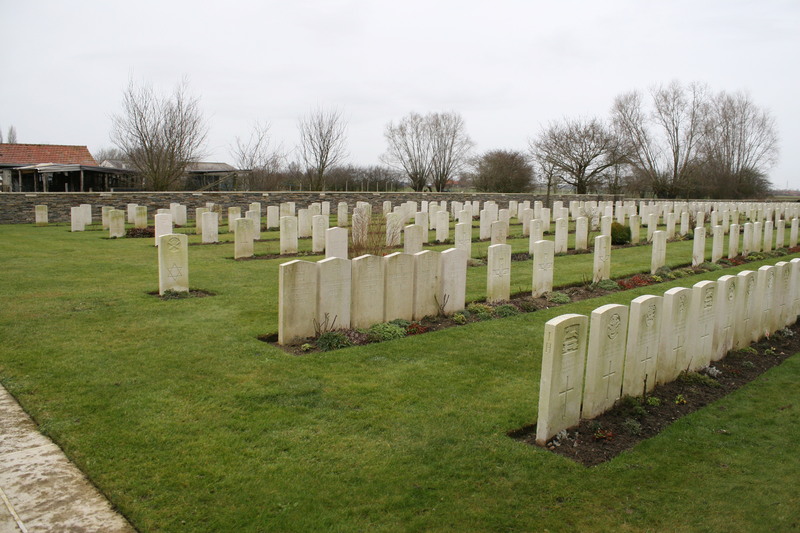 There are now nearly 900 burials in total in the cemetery, of which just over half are identified. 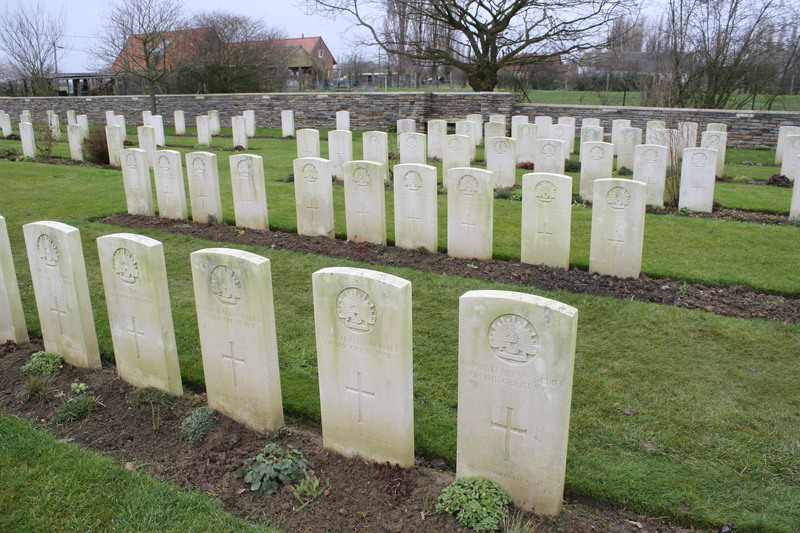 353 of the graves here are known to be Australian, but only 87 are identified, and of these only twelve are known to have died on 19th July 1916 (one of them, Private Frederick Watkins, is visible in the second row above, at the end of Plot II Row D), the day of the attack at Fromelles, and none the following day as the battle continued. 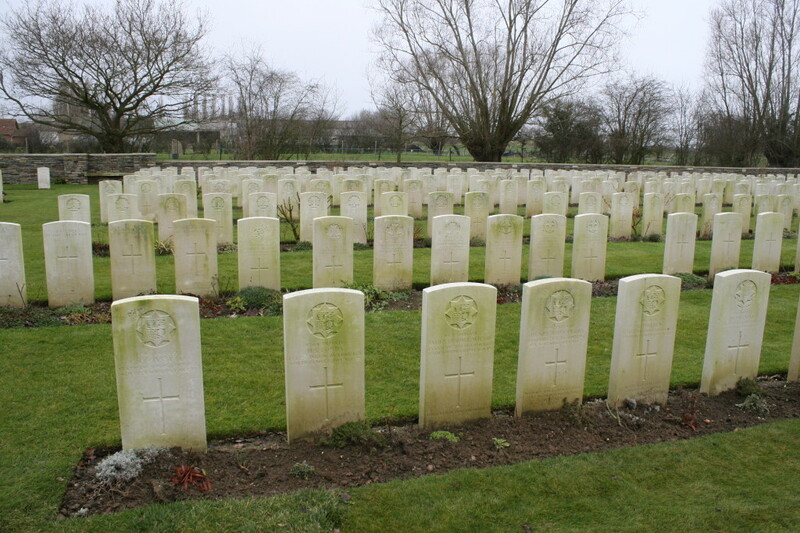 Which is not to say that there are just twelve Fromelles casualties here. 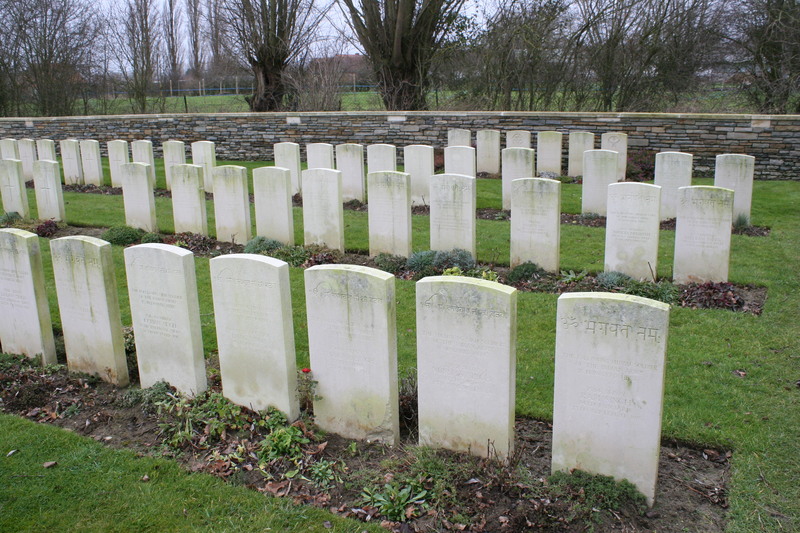 266 headstones simply bear the inscription ‘An Australian Soldier of the Great War’. 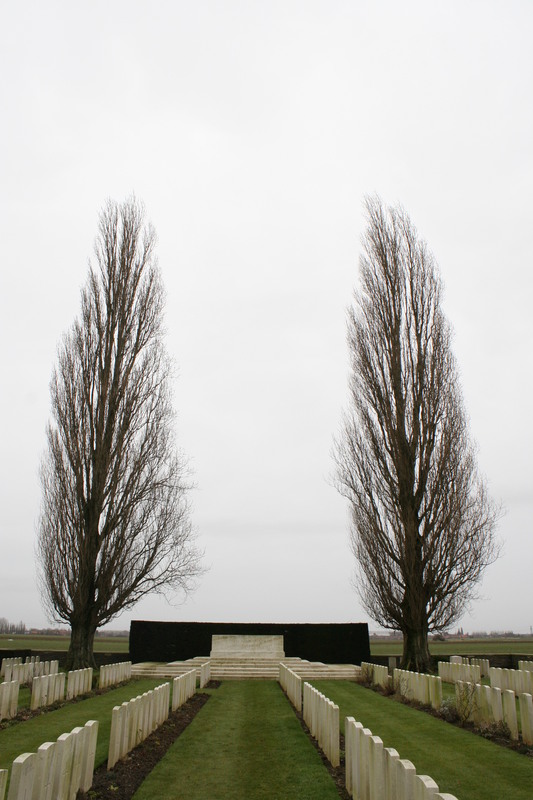 As we find ourselves travelling nearer to Fromelles I shall explain more about the battle, but for now you will have to be content with one stark fact; in one single night the Australians lost more men than in any other Australian conflict, before or since. More men than in the Boer War, Korean War & Vietnam Wars put together. The 5th Australian Division sustained over 5,500 casualties on the night of 19th/20th July 1916, of which over 1,900 were killed, 1,299 of whom had no known grave at the time. And that is without the efforts of the 61st (South Midland) Division, who took nearly 1550 casualties the same night. It was a horrible introduction to the Western Front for the Australians, and created a lasting antipathy towards the (mainly) British staff who directed the attack. But all that is for later. 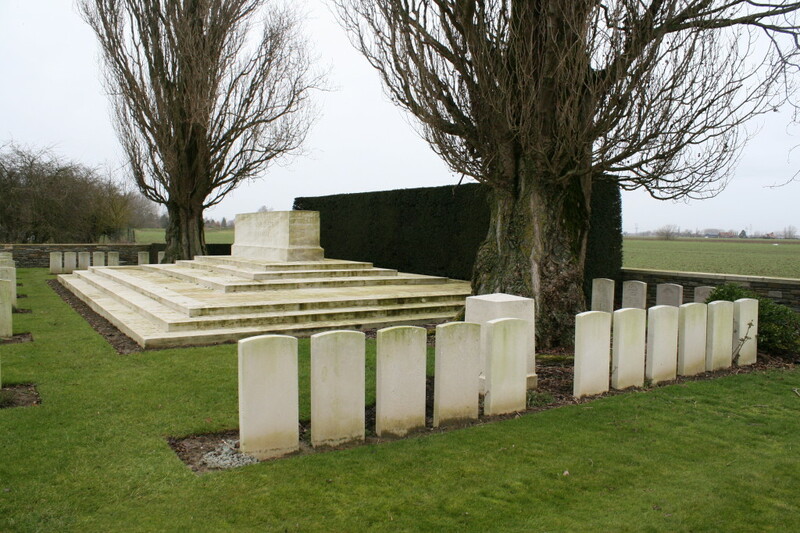 For now, and bearing in mind the quote at the start of the post, there is no doubt that many of the unidentified men buried here, both Australian and British, are casualties of the Fromelles fighting. Looking south from the northern corner of the cemetery. Welcome back Baldrick, by the way. Sorry about all that gallivanting about on the Somme and in Arras with those other people. Just you and me again now, my friend. …are special memorials to Indian soldiers, men of the Punjabis, Baluchis & Vaughan’s Rifles, killed in 1914 & 1915 and, on the far right, a Ghurka Sepoy who died in 1920. In fact there are 42 graves in this Indian Plot near the northern corner of the cemetery, the majority killed in September 1915, although the earliest, two men of the 15th Ludhiana Sikhs, are from late October 1914. 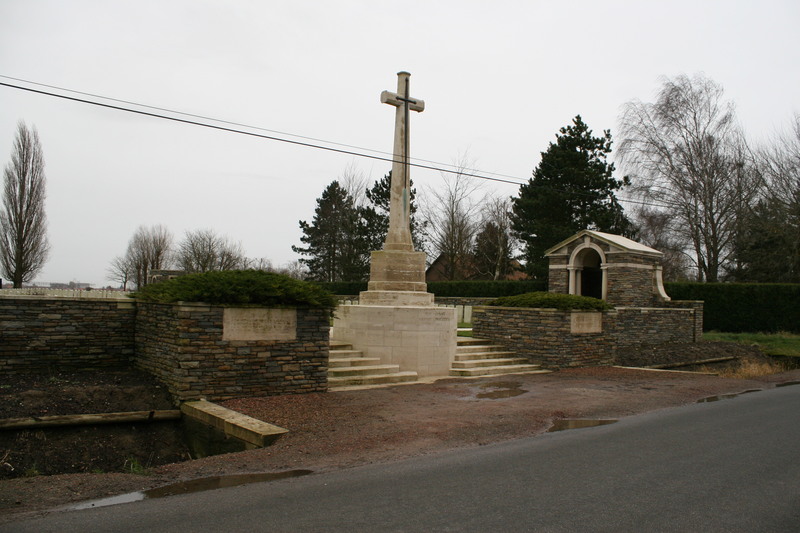 Many were originally buried in Pont-de-la-Lys Indian Cemetery near Estaires. Plot IV, tucked away in the northern corner, is one of the smallest plots in any cemetery I have visited. 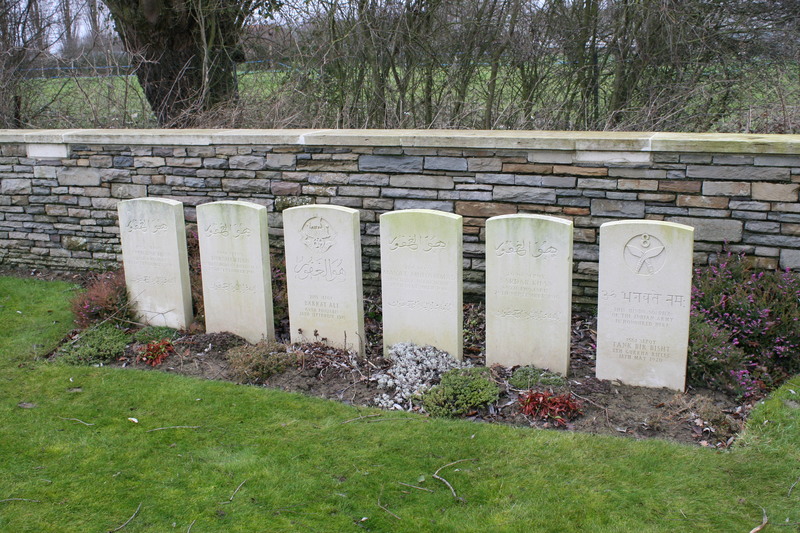 Just eight headstones, all eight unidentified. 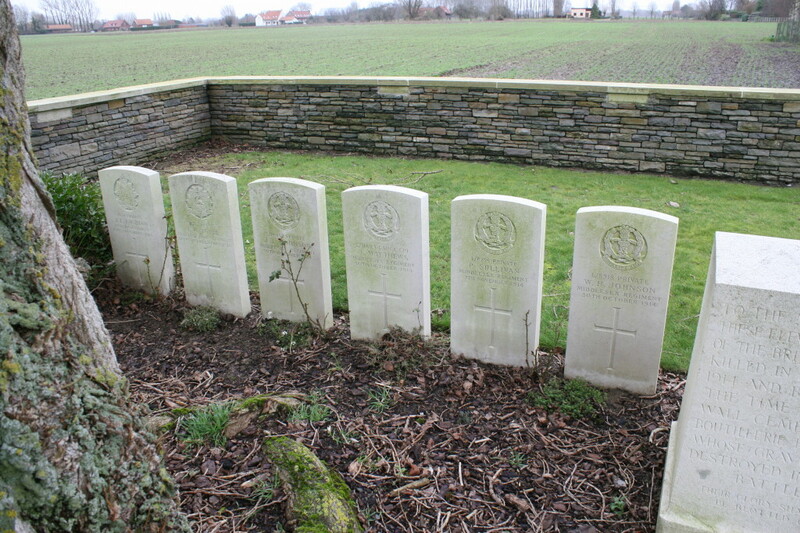 More unidentified burials in Plot III, adjacent to the Indian Plot. 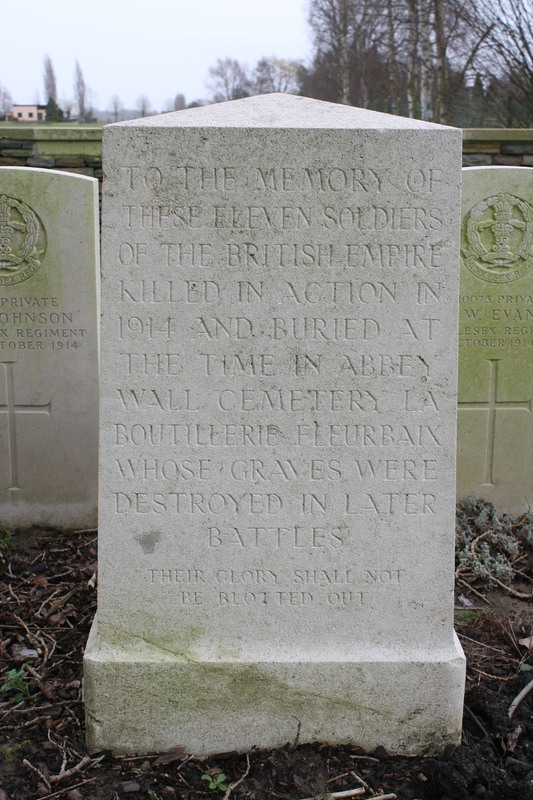 …fifteen special memorial headstones remember men whose graves have been lost. 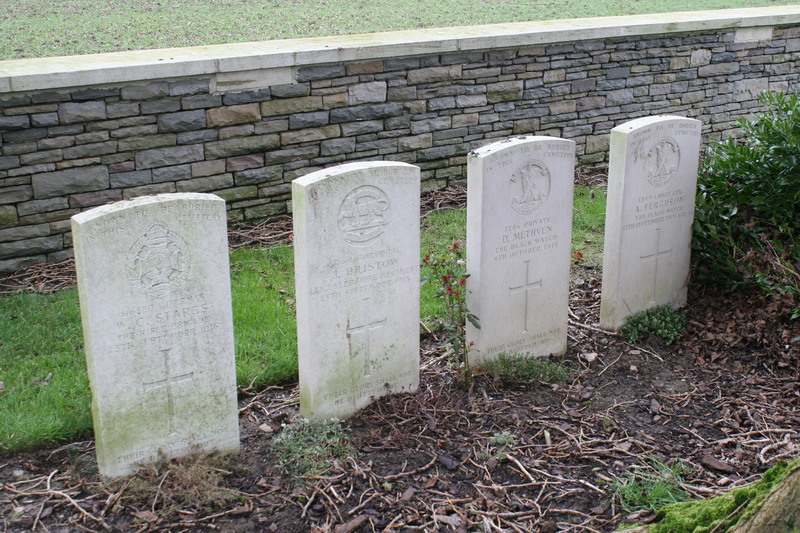 Along the boundary wall these headstones remember four men killed in the autumn of 1915 who are known to be buried among the unidentified burials in the cemetery. 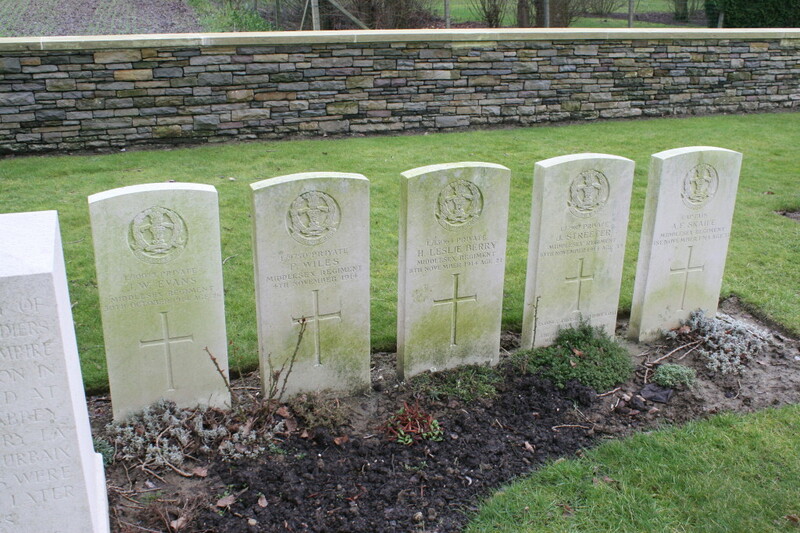 …remember these men who were originally buried in another Fleurbaix cemetery that no longer exists, Abbey Wall Cemetery. …and nine of them are remembered here. The 1st Bn. 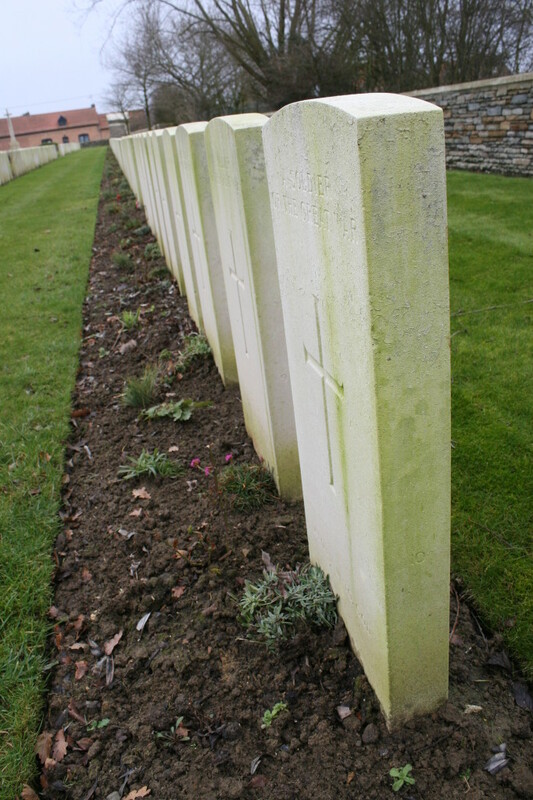 Middlesex Regiment had helped fight the Germans to a standstill at Armentières in mid-October, and by the time they were relieved on 14th November their War Diary shows a steady toll of daily casualties as the Germans turned from defence to attack throughout the rest of October and early November. 68 identified men of the Middlesex Regiment, and almost certainly a number of unidentified Middlesex men found on the battlefield after the war, are now buried here in Rue-David Military Cemetery. 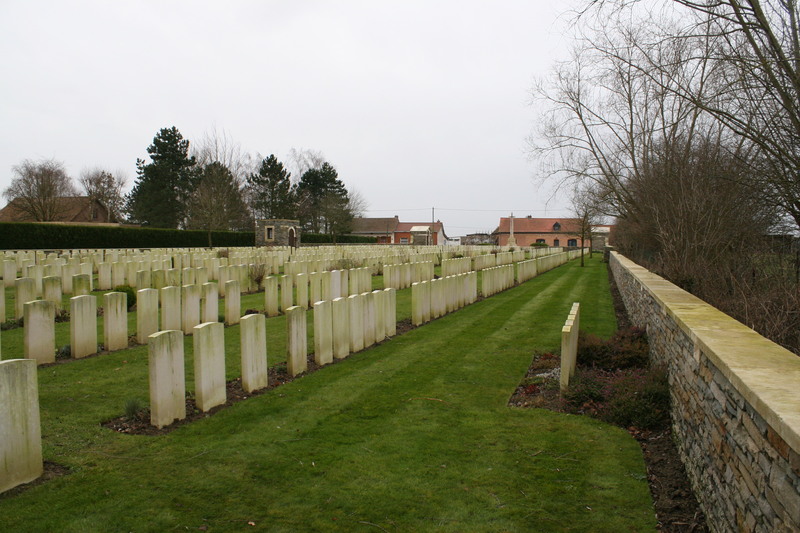 …and, as we make our way slowly back down the cemetery, this view looks towards the Cross from the middle of Plot II between Row E (left) and Row D (right). 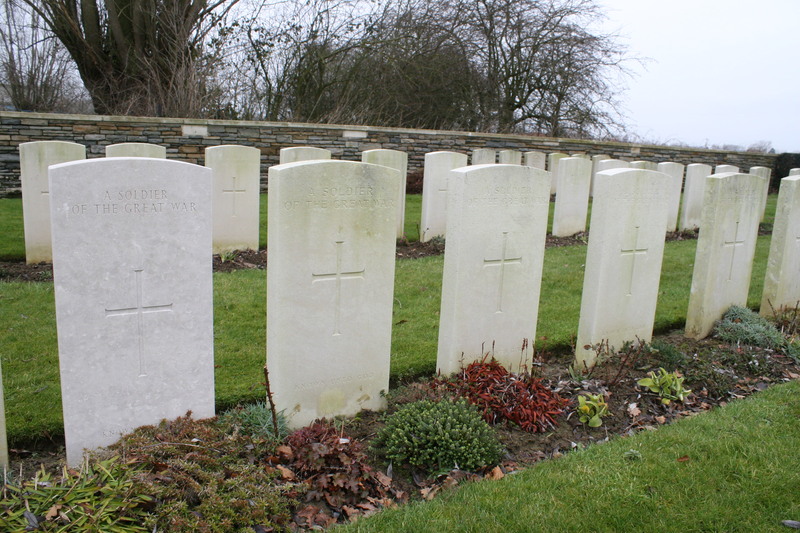 On my return home I discovered that somewhere in Row E is the grave of Private Billy Ellsdale, 47th Bn. Australian Infantry, who died on 7th July 1916, and is probably the first Aboriginal soldier killed in France. 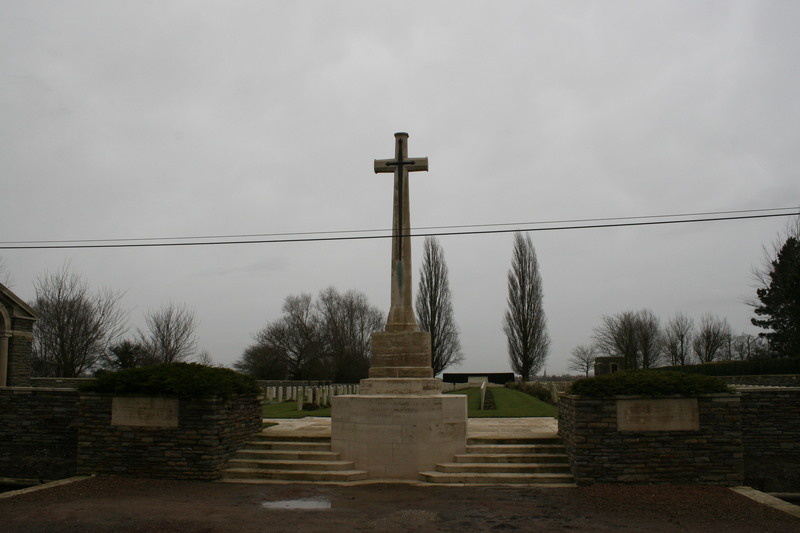 The 1/13th London Regiment (1st Kensingtons Battalion), formerly the 4th (Kensington) Middlesex Volunteer Reserve Corps (3rd Volunteer Battalion, King’s Royal Rifle Corps), some of whose men are buried here in Plot II Row H (above), had only arrived in France on 4th November 1914, and although its first major action would be the Battle of Neuve Chapelle in March 1915, these graves from later in November and early December 1914 show that its first casualties were not long in coming. Looking west at Plot I from half way down the cemetery. Not all the graves in the plot are wartime burials. 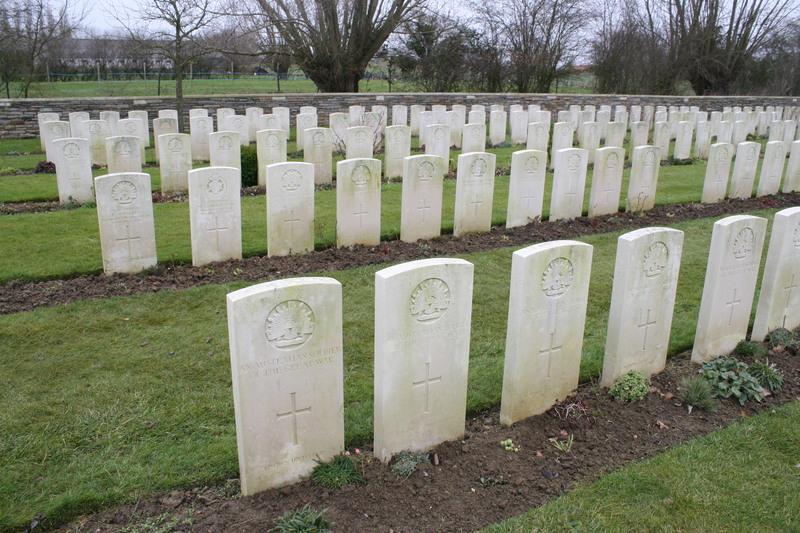 The second half of Row G (centre above) and Row H (left above & below) are all post war reinterments. 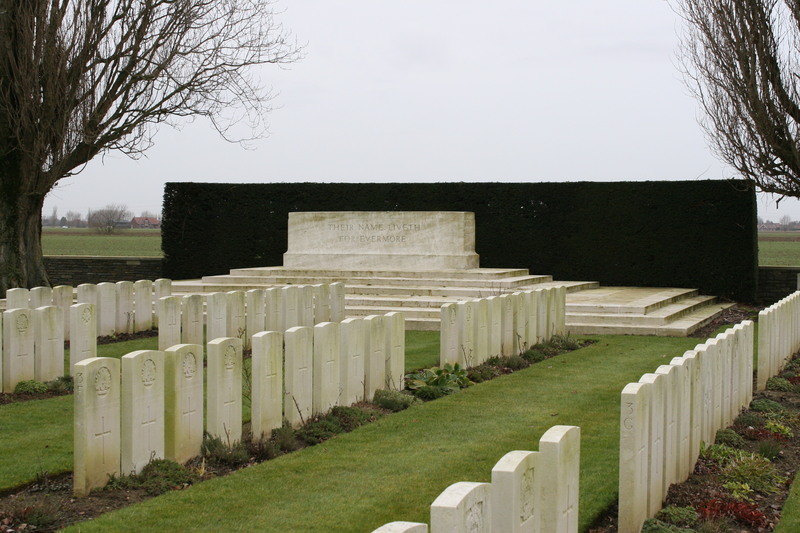 By far the majority of the burials in Row H are men found on the battlefields of early 1915 or, as in the case of the twelve South Staffordshire Regiment men (beneath the tree a little way down the row), in an orchard. 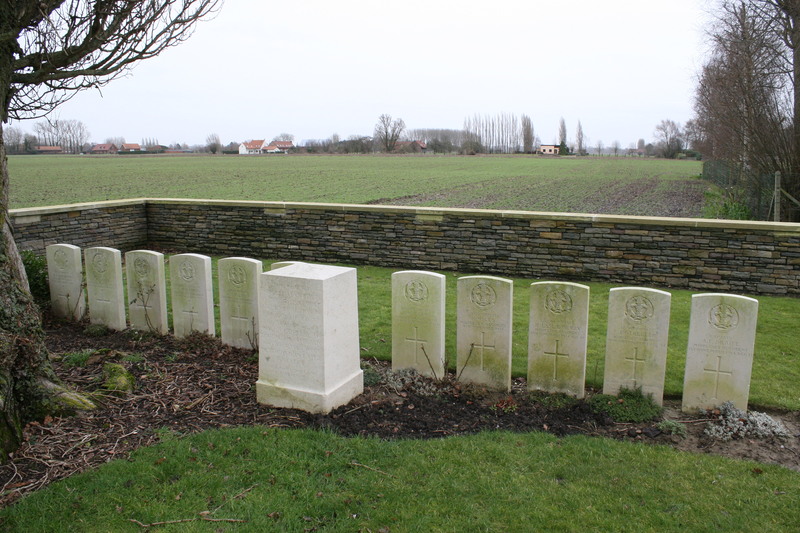 These men were originally buried in the orchard of what was known as Smith’s Villa, at a crossroads a mile west of Bois-Grenier. 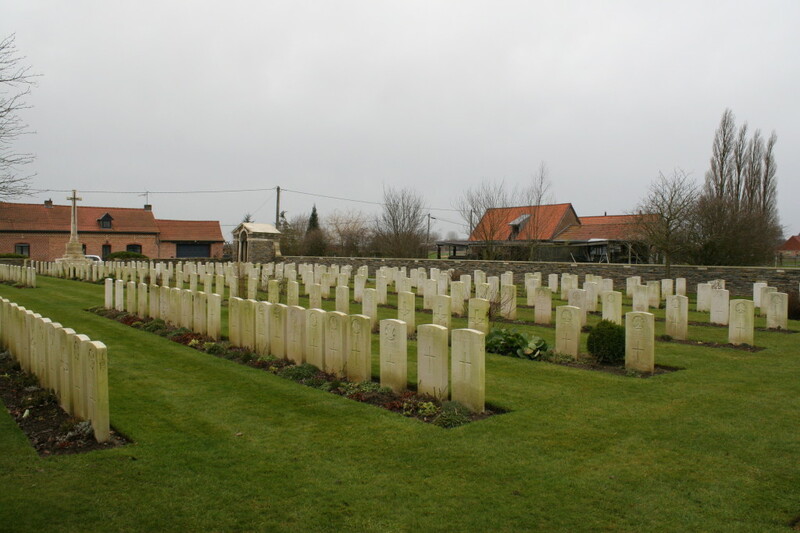 Fish-eye panoramic view of Rue-David Military Cemetery. As we depart, those of you who have only joined this site in the last six months or so might have noticed far more detail about this cemetery and the different plots within it than on our Somme visits. Which is just the way it is. This website has its roots in Flanders and the men who fought and died there. Never forget your roots. Just before we go, a few hundred yards south east of Rue David is the hamlet of La Boutillerie, literally a handful of houses on a bend in the road, and it was in the fields somewhere thereabouts that the first (and, to this day, I believe, still the youngest) Australian V.C. of the Great War was won; Private William Jackson, just 18, made several journeys into No Man’s Land on the night of 25th/26th June 1916 to rescue wounded men, despite sustaining a wound from an exploding shell that would result in the loss of an arm. 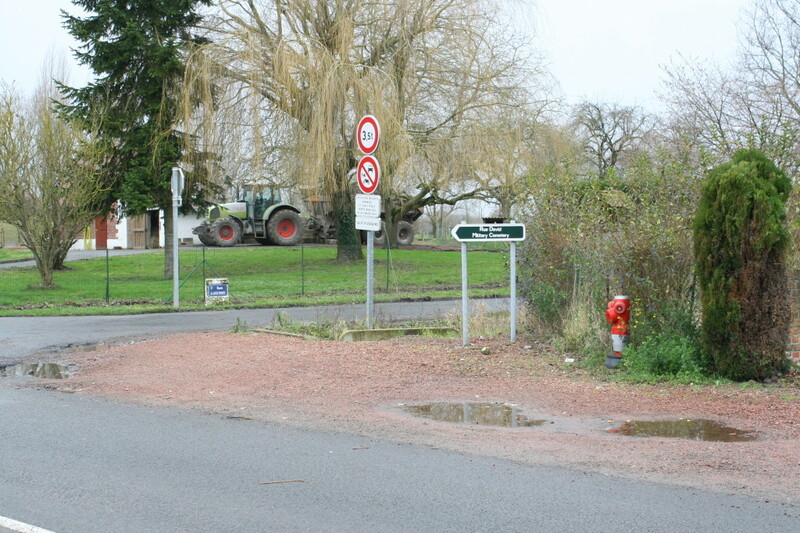 Sign post to Rue-David (actually this sign is in the little village of La Croix Maréchal, a few hundred yards north of the cemetery), but next we are off to Rue-Petillon Military Cemetery, about half a mile across the fields to the south west. I came across your blog here and enjoyed reading it. It has filled in a few gaps of my knowledge. 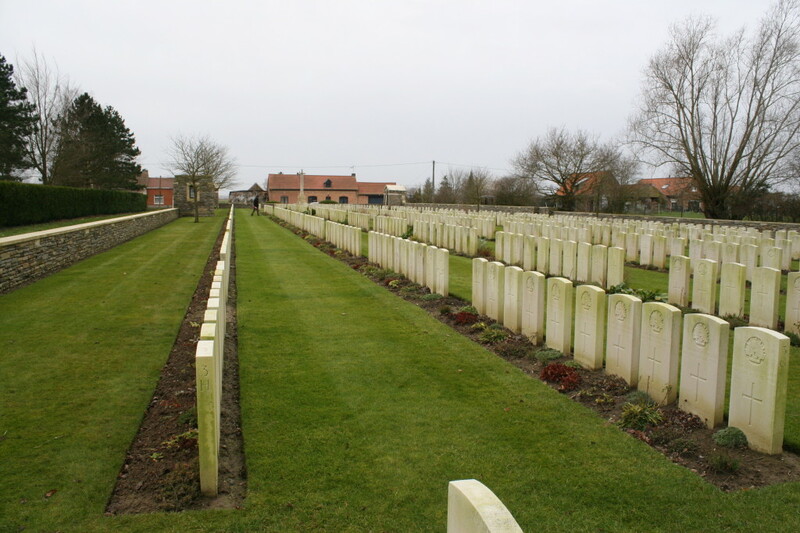 My great grandfather is buried in Rue-David Cemetery. Lance Corporal Michael McTighe (12845) of the Middlesex Regiment, KIA 03-11-1914. I have visited the grave twice. The last occasion was on the 100th anniversary of his death. A very moving moment. The plot is kept immaculate, which is the absolute least we can do. I have identified his headstone on one of your photos but the inscription is out of view. Hello Brian Thanks ever so for taking the trouble to comment, and for enjoying reading this post. I went past the cemetery only last weekend, but on the way elsewhere on this occasion. You’ve got me looking for your Great Grandfather in the photos now too! He’s certainly in some, but not in the foreground, I’m afraid.